Basic Information: WBSEDCL Recruitment department is looking to recruit fresher candidates for Assistant Manager Posts on the regular basis. Department required “Civil, Electrical, Mechanical & IT/CSE” Engineers. 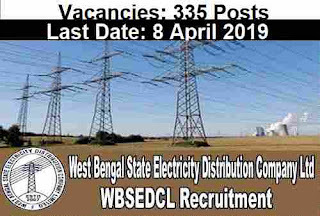 There are total 335 vacancies for these job profiles which are going to be filled up through this WBSEDCL Recruitment 2019. Applicants who are willing to apply these WB Govt jobs must satisfied all the eligibility conditions and criteria before applying online for this recruitment procedure. Read out the various section below before applying. 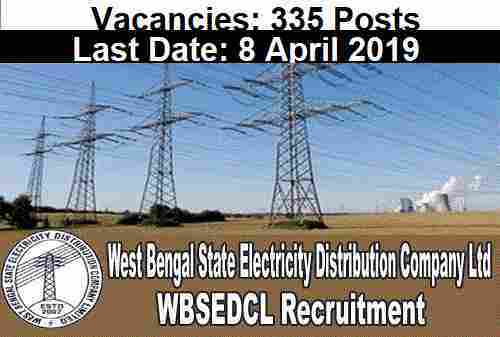 Those who have completed their following qualification: “B.E/B.Tech/B.Sc(Engineering)” Degree in relevant Engineering stream can apply for these WB Govt Jobs. You have to pay the examination fee through Bank Challan at any branch of United Bank of India. NO online mode for the payment of the application fee. 7th March 2019 is the Start Date to Apply. Process for Applying: Concerned applicants may apply online through the official website “www.wbsedcl.in”. The link for applying this WBSEDCL recruitment process will be active from 07th March 2019 to 08th April 2019. After the last date no application will be accepted by the department. Selection Procedure: The selection of the applicants under this WB Govt Jobs recruitment process will be based on GATE Score 2019 and Personal Interview.